"Shahid Beheshti" redirects here. For the village in Iran, see Shahid Beheshti, Iran. 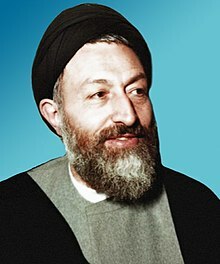 Seyyed Mohammad Hosseini Beheshti (Persian: سیّد محمد حسینی بهشتی‎; 24 October 1928 – 28 June 1981) was an Iranian jurist, philosopher, cleric and politician who was known as the second person in the political hierarchy of Iran after the revolution. Dr. Beheshti is considered to have been the primary architect of Iran's post-revolution constitution, as well as the administrative structure of the Islamic Republic. Beheshti was assassinated along with more than 70 members of the Islamic Republic Party on 28 June 1981. Beheshti is also known to have selected and trained several prominent politicians in the Islamic Republic, such as current President Hassan Rouhani, former President Mohammad Khatami, Ali Akbar Velayati, Mohammad Javad Larijani, Ali Fallahian, and Mostafa Pourmohammadi. Beheshti also served as the Secretary General of the Islamic Republic Party, and was the head of the Iranian judicial system. He further served as Chairman of the Council of Islamic Revolution, and the Assembly of Experts. Beheshti earned a Ph.D. in Philosophy, and was fluent in English, German and Arabic. Following his death, Ayatollah Khomeini referred to Beheshti as a person who was "as a nation for us." Beheshti was born in Isfahan in 1928. He studied both at the University of Tehran and under Allameh Tabatabaei in Qom. Between 1965 and 1970, he led the Islamic Center in Hamburg where he was responsible for the spiritual leadership of religious Iranian students in Germany and Western Europe. In Hamburg, he also worked with Mohammad Khatami and was among his influences. Since the early 1960s, he was involved in activities against the monarchy and was arrested several times by the Shah's secret police, the SAVAK. Beheshti joined Ayatollah Khomeini in Najaf, Iraq, where the latter was in exile. There he became part of Khomeini's underground movement. Following the Islamic Revolution, he became one of the original members of the Council of Revolution of Iran and soon its chairman. As vice-president, he played a particularly important role in promoting the principle of velayat-e faqih as the basis for the new constitution. In the first post-revolutionary Iranian parliament, he led the Islamic Republic party together with Ali Akbar Hashemi Rafsanjani. (He never campaigned for the parliament though, as he was already the head of Iran's Supreme Judicial System). Behesti was the founding member, first general secretary and a central committee member of the party. He was also planning to run for the presidency in the first presidential elections, but withdrew after Ayatollah Khomeini told a delegation of Rafsanjani and Khamenei that he preferred non-clerics as presidents, which led to the Islamic Republic party's endorsement of first Jalaleddin Farsi and then, Hasan Habibi as candidate. Beheshti died in the Hafte tir bombing on 28 June 1981, when a bomb exploded during a party conference. The Islamic Republic of Iran first blamed the Tudeh Party, SAVAK and the Iraqi regime. Two days later, Ruhollah Khomeini accused the MEK. A few years later, a Kermanshah tribunal executed four "Iraqi agents" for the incident. Another tribunal in Tehran executed Mehdi Tafari for the same incident. In 1985, the head of military intelligence informed the press that this had been the work of royalist army officers. Iran's security forces blamed the United States and "internal mercenaries". Along with Beheshti, many clerics, ministers, and officials also died. Supreme Leader Ayatollah Khomeini was reportedly very moved by Beheshti's death. Today, a commemoration ceremony is organized each year on the day of Beheshti's assassination. Banking and financial laws in Islam. Behesti had an important role in writing the constitution of Iran, particularly the economic section. He believed in cooperative companies (Ta'avoni) in the field of economy and partnership and co-operation in lieu of competition in economic affairs. According to him, in Ta'avoni companies there is no mediation between producer and consumer. He also asserts that in such as companies, rights belong to humans rather than stocks. He claims the foundation of Iran's Constitution to be Islamic, and that Iran's revolutionary Islamic system is at the same time a people-oriented system according to the volition of the Iranian people. This system is designed for the betterment and evolution of humankind. According to Beheshti, one of the most important pillars of political thought is that human could walk in right path along with faith to truth. According to Beheshti, the origin of property and possession in Islam is working. Beheshti raised some epistemological questions in "Knowledge from Quran's view point". He believed that knowledge no definition, and that no definition can be found. Beheshti believed there are only four sources of knowledge: perception, introspection, reason and revelation (or Vahy). He coupled an empiric attitude with foundationalism in his structure of knowledge. Beheshti, opposed to modernism, believed that there is a strict relationship between individual and collective aspects of human being. According to him, although the history of humans shows that they are always tend to falsehood (or Batil), the Quran says there is a strong link between humanity and truth. Beheshti also emphasized on the theory of Fitarat (innateness or primary nature) in anthropology. Beheshti also believed the human soul had to be considered in the whole rather than in part. According to the theory of primary nature, one of the characters of human soul is volition and choosing. At the same time humans undertake responsibility for their actions. Humans have two important qualities: freedom of choice and responsibility. In other words, Beheshti believes Islam has a realist slant in respect to humans as it considers humans as a mix of freedom of choice and responsibility. Whilst humans are given choice, faith has an important role in this way and could help humans in making decision. ^ "BEHESHTI WAS SEEN AS NO. 2 FIGURE IN IRAN AFTER THE ISLAMIC REVOLUTION". The New York Times. 29 June 1981. ^ The Editors of Encyclopædia Britannica. "Mohammad Hosayn Beheshti". britannica. Retrieved 24 October 2003. ^ "Imam Khomeini - Beheshti Was Himself a Nation for Us : Imam Khomeini". en.imam-khomeini.ir. ^ Asayesh, Hossein; Adlina Ab. Halim; Jayum A. Jawan; Seyedeh Nosrat Shojaei (March 2011). "Political Party in Islamic Republic of Iran: A Review". Journal of Politics and Law. 4 (1). Retrieved 29 July 2013. ^ Rouleau, Eric (1980). "Khomenei's Iran". Foreign Affairs. 59 (1): 1. doi:10.2307/20040651. JSTOR 20040651. Retrieved 5 August 2013. ^ James Buchan (2013). Days of God: The Revolution in Iran and Its Consequences. Simon and Schuster. p. 293. ISBN 978-1416597773. ^ Ganji, Manouchehr (21 September 2017). Defying the Iranian Revolution: From a Minister to the Shah to a Leader of Resistance. Greenwood Publishing Group. ISBN 9780275971878 – via Google Books. ^ Mahtafar, Tara (28 June 2009). "Beheshti's Ghost". PBS. Tehran. Retrieved 1 August 2013. ^ "نقد تحلیلی شناخت از دیدگاه قرآن اثر آیت الله دکتر بهشتی". Wikimedia Commons has media related to Mohammad Beheshti. This page was last edited on 12 April 2019, at 18:01 (UTC).